New research published by the Business Centre Association (BCA) in collaboration with CBRE claims that the business centre sector enjoyed a 13 percent increase in turnover and was home to around 11 percent more workers in 2015 and 2016, despite initial fears about the impact of Brexit on the sector, and increasing competition from new entrants into the market. The sector is worth around £3.3bn in terms of turnover, up from £2bn in 2013. The findings come from The UK Business Centre Market report which surveyed 580 business centres, representing 23 percent of the sector across the country, to assess the current state of the market. Overall, the report found the UK wide business sector is now home to 93,000 individual small businesses which employ over 480,000 people, supporting around £18bn of GDP. The research is published amidst a flurry of recent acquisitions and new entrants coming into the market place. In June 2017 alone, it has been announced that Blackstone have acquired a majority stake in BCA member, The Office Group (pictured), whilst Carlyle Group have made three acquisitions to boost its Uncommon flexible workspace venture. 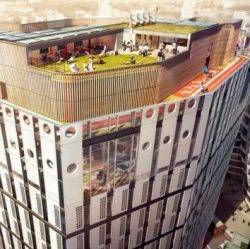 British Land have also launched Storey, a new flexible workspace concept. The UK wide sector is now home to 93,000 individual small businesses which employ over 480,000 people, supporting around £18bn of GDP. Turnover in the sector increased by 13 percent and the number of workers in business centres has increased by 11 percent in 2016 compared with 2015. The research shows the turnover in the sector was worth in the region of £3.3bn in 2016, up from £2bn in 2013. The amount of space taken per worker in a business centre has fallen by 8 percent year-on-year between 2013 and 2016. 74 percent of businesses in business centres have 5 employees or fewer. 39 percent of businesses stay in business centres for more than three years, up from 14 percent in 2013, providing further evidence that the sector is a long-term option for those seeking flexible workspace for their business. Over 90 new centres opened in 2015 and 2016, providing a home for thousands of the UK’s new and growing companies. The evidence suggests that this trend will continue regardless of Brexit as more people take advantage of the terms, services and in particular leading technology provided by business centres. This increase in competition comes amidst wider economic concerns around Brexit. As part of the report, 38 percent of operators sampled said Brexit had a slightly negative impact on their business, 34 percent of operators sampled said it had no impact and 20 percent said it had a positive impact. Whilst it was felt there was an initial pause in activity after Brexit, demand for space has recovered. The continuing success of the sector within the office market is also evidenced by the growth in competition over the two years, as high levels of demand from customers drives ‘fleet of foot’ operator innovation, and creates clearer and more distinctive customer offers and facilities. Whilst the sector has traditionally been seen as a stepping stone on the way to long-term leases, the evidence suggests that the sector is now being seen as a long-term option with 39 percent of businesses now staying in businesses centres for at least three years, an almost three-fold increase on 2014.